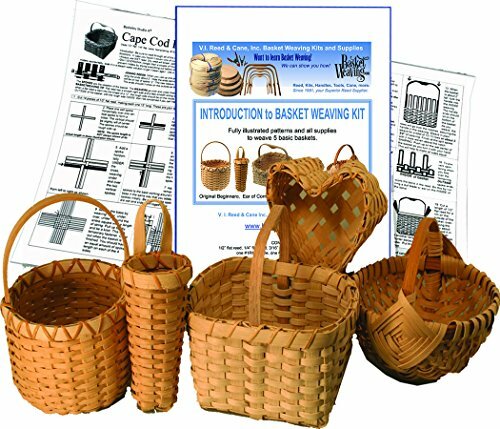 Our Introduction to Basket Weaving Kit includes FIVE of our easiest classic basket kits and is going to get you off to a great start in the wonderful craft of basket weaving! Save over 25% off the price of the individual basketweaving kit prices. Like all of our kits, this jumbo kit comes with easy, fully illustrated step-by-step instructions that show you how to make the baskets. Includes hardwood basketry handles & hoops, and more than enough reed & cane to complete all the baskets. There's even some extra reed to experiment with when you're finished with the first five. The Perfect Hobby for the Crafty Teenager or Adult! As shown above, you'll receive our 12-page, 8.5 x 11" Introduction to Basket Weaving instruction booklet. We know that you'll be pleased with your purchase! SKILLS LEARNED: square bases with flat materials, round radiating spoke bases with flat materials, plain weave, folded base, adding notched handles, Cut and Tuck, lashing rims, melon basket construction with God's Eye pattern (also called egg or rib baskets), heart shape baskets. Original Beginner's Basket Kit, Cape Cod Blueberry Basket Kit, Ear of Corn Basket Kit, Melon Basket Kit, Mini-Heart Basket Kit, 6" diam. x 8.5" tall, 6" diameter x 7" tall, 2.5" diam. x 8.5" tall, 8" diameter, 8" hoops; 5" wide and 3" deep.